For over 15 years, Kentucky State University (KSU) has been helping small-scale poultry farmers get their products into the hands of consumers. 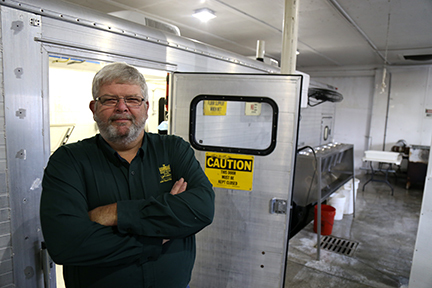 KSU’s poultry mobile processing unit (MPU) began as an idea in 1997 by farmers and Heifer International and came to fruition in 2001, according to Steven Skelton, a cooperative extension coordinator at the University. The MPU was immobilized for a short period of time before KSU purchased it from Heifer International. “The MPU is a farmer-friendly processing plant on wheels for all types of poultry (excluding waterfowl), rabbits, and various types of aquaculture including paddlefish, caviar, freshwater prawn and red claw crawdads,” Skelton said. The MPU is a 20-feet long, eight-foot-wide gooseneck trailer that was converted to use as a processing facility with a hot water heater, water lines and electricity. Other additions include a machine that vacuum seals the meat and a poultry/rabbit saw. It’s one of very few in the country that Skelton is aware of. There are many benefits for farmers using the MPU, Skelton explains. For one, he said he’s heard horror stories of farmers taking their product to a private processor and receiving someone else’s in return. Cost is a big benefit, too, he explained. Skelton said farmers can process 100 birds for $134.50, including vacuum bags or 100 rabbits for $122. The MPU costs $75 per 7.5 hour day for aquaculture processing. It’s much more cost-effective and customizable than paying up to $8 per bird at a private processor, Skelton said. There were many obstacles involved with developing the MPU, but all have led to a clean, safe environment for processing meat. Skelton beams with pride when he discusses his record with regulating agencies. Skelton said he’s inspected by the USDA annually. The MPU can be transported to other locations, but the location must have an approved docking station. If no approved docking station is present, only aquaculture products may be processed. Currently only three sites have approved docking stations: the Kentucky State University Harold R. Benson Research and Demonstration Farm, the Morehead State University farm or the Jackson County food kitchen. One docking station is under construction at the Laurel County African American Heritage Center and is due for completion in 2018. The docking stations are subject to inspection by local, state and federal officials at any time without notice, Skelton said. Skelton said nine schools are involved with the MPU through FFA programs. For more information about the MPU, contact Steven Skelton at (502) 597-6103 or steven.skelton@kysu.edu.